I was on the last train into Singapore tonight and when we arrived, we realised they were preparing for the same train to leave Singapore. We saw a huge mob of people coming towards all the passengers who just got off the train. We knew why later. The Sultan of Johor, Sultan Ibrahim Ismail was the VIP in our midst. He was to drive the last train out of Singapore at 11 PM. The Sultan earlier passed right in front of me and shoke the hands of the person beside me! He then signed the t-shirt in front of us. We left Tanjong Pagar KTM Station and rushed to the Bukit Timah Station on the way home after a long day. We made it just in time and caught the train driven by the Sultan of Johor. Can you spot him? There was a huge crowd waving good bye at the Bukit Timah Station! At the stroke of midnight, Tanjong Pagar Station and Bukit Timah Station will be returned to Singapore. Saw this yesterday on the way home after work. The clouds were so different, billowing clouds. It's as if someone's blowing them! The skies were so blue too! 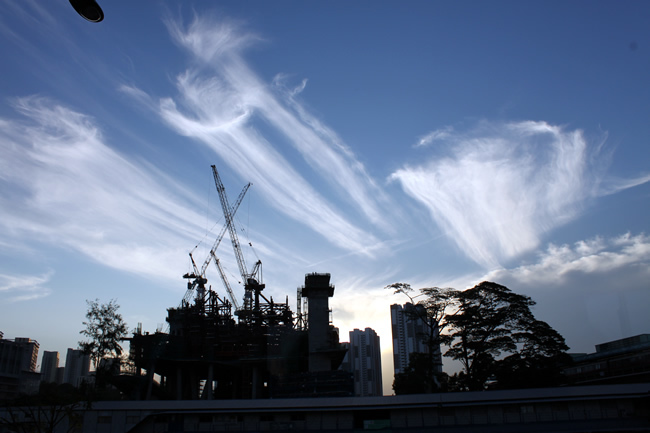 The building being constructed is a new mall and a church that's coming up in One North, just beside Buona Vista MRT Station. Hmm... Another 'ship' like building after MBS' Ark. Is that a prophesy that Singapore's going to be flooded? 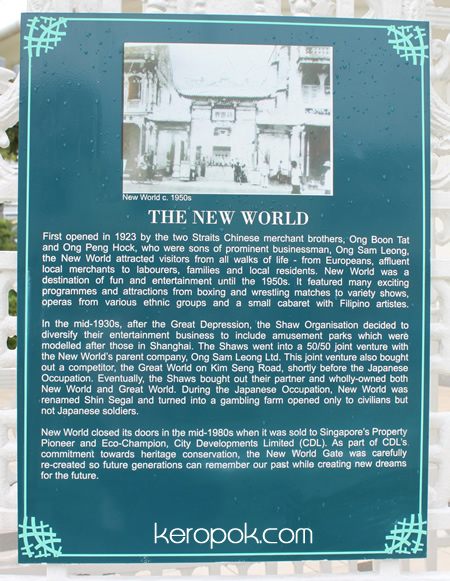 That the new name for New World Park, the earliest Amusement Park that existed in Singapore way back in 1923. It must be the equivalent of how Universal Studios in Resorts World Sentosa is today to people long ago. Here's a write up of history on the board at the site. 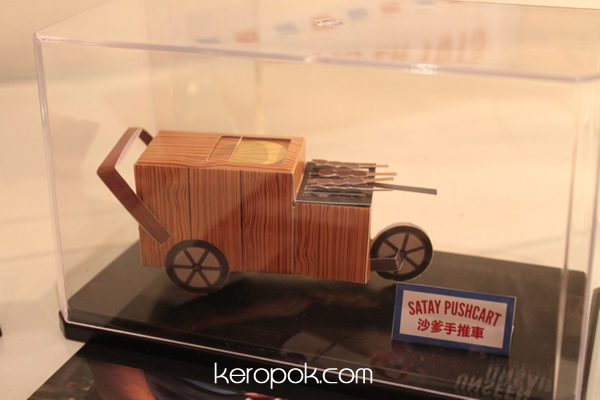 I was at Singapore's Eco Mall for some food and shopping just the other day and took these photos. Singapore, 27 January 2011 – The New World Gate was officially unveiled today at City Green, the state-owned park adjacent to City Square Mall, Singapore’s first eco-mall. 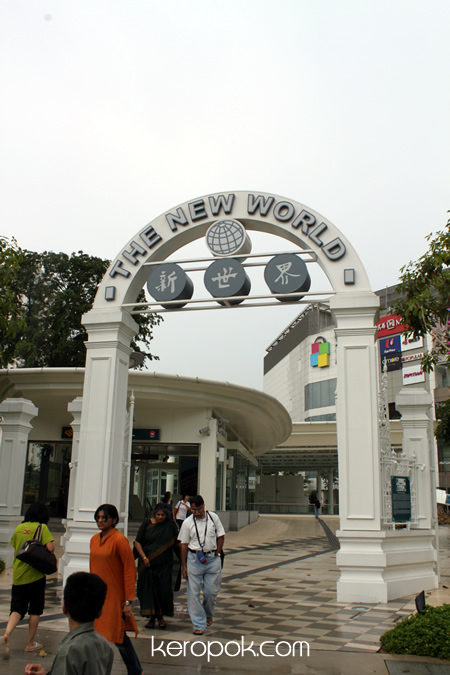 With the support of National Parks Board (NParks), National Heritage Board (NHB) and Urban Redevelopment Authority (URA), City Square Mall, owned and managed by City Developments Limited (CDL), has carefully reconstructed the gate for Singaporeans to remember the history of the former New World Amusement Park. The gate, installed at the entrance of City Green on Serangoon Road, features the words “The New World” on its gateway arch to symbolise the interconnectivity of Singapore’s past, present and future. CDL’s efforts to restore the gate stems from its Corporate Social Responsibility (CSR) conviction to conserve the environment care for the community and to promote Singapore’s cultural heritage. "We have always been relentless in our CSR initiatives to create value for communities while ensuring we are responsible developers. Our initiative to install the reconstructed New World Amusement Park gate will help remind visitors about the history of the site,” said Mr Chia Ngiang Hong, Group General Manager of CDL. “This gate is symbolic of the memories attached to the former New World Amusement Park, and its presence at the entrance of City Green will bring about a sense of nostalgia of the days where the amusement park was a bustling activity hub. These shared memories are a great way for the community visiting the mall to bond, where now, City Square Mall is the new community hub for families living in the neighbourhood to visit to shop, dine and relax,” said Edward Tan, Director of Operations & Human Resource & Admin at Metro, the anchor tenant of City Square Mall. With its focus on the community and the environment, City Square Mall, like the former New World Amusement Park, is the perfect setting as a community hub where families and friends gather for social activities. 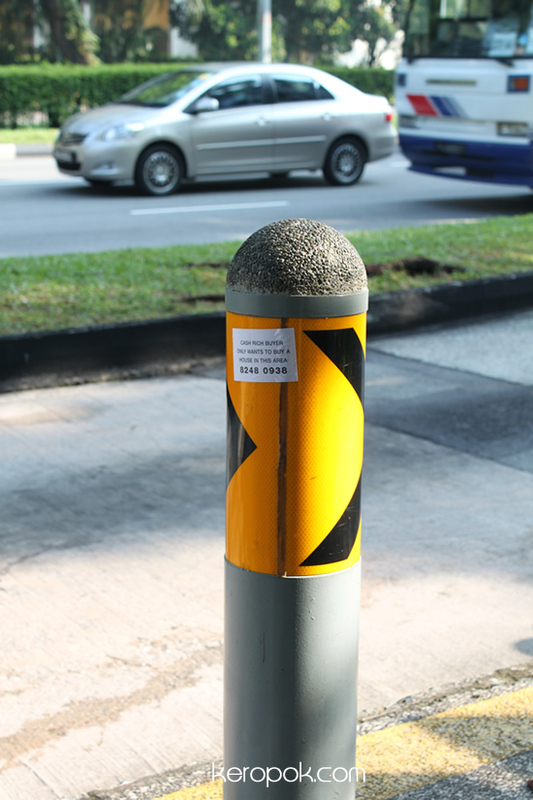 Every now and then, you will see lots of garbage bags on the side of the roads in Singapore. Wonder why? It's leaves, twigs and other rubbish from the drainage opening on the roadside curbs. It seems they are cleaning the holes more often after water can't seem to flow because the holes are blocked. Maybe the authorities can get them redesigned so that cleaning is not needed? Wow! The word I said when I saw the tables all lined up and getting ready for business few hours later. The tables were lined up so straight! 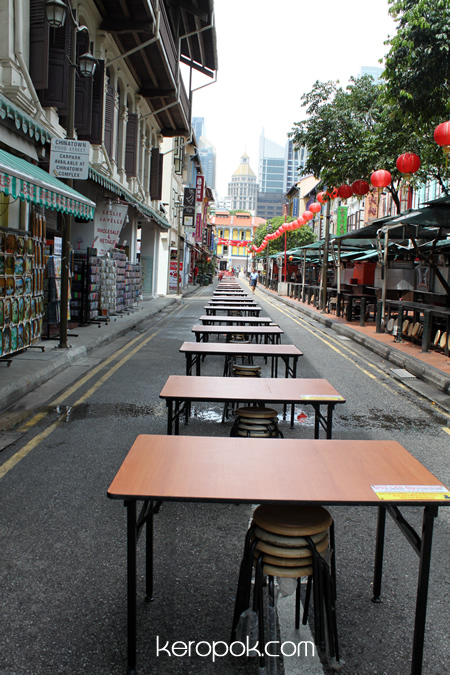 This is Smith Street in Singapore Chinatown. It is also known as the Chinatown Food Street. It's kind of a touristy place to eat. I only come here when friends or relatives visit! Looking again at how straight the tables were arranged, do you think the person who arranged it had some obsessive compulsive behaviour? I really want to know how they do it! Everytime I pass by this place, I have an urge to take a photo of it. So here it is. Since the last 'Swiss Invasion', I think security has been tightened. 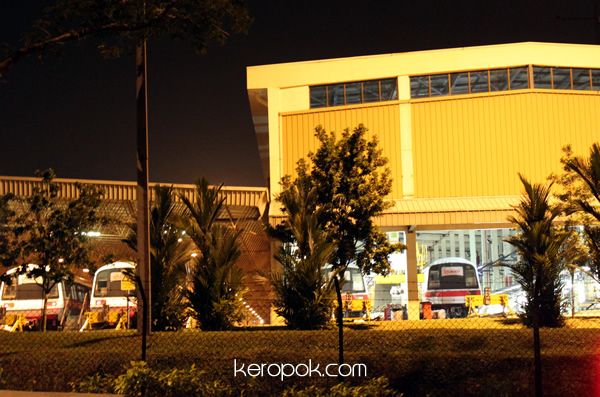 I always wonder if SMRT is going to organise some guided tours of the depot. I think many people would be interested. Probably not for everyone, but for people who takes the trains very frequently. They could always check the transaction records on our EZ Link / Flashpay cards to see how often people take their trains. If McDonald's have Open Doors for their kitchen, Universities have Open Days, why not SMRT having an Open Train Day? Looking at the huge space they occupy reminds me of Melbourne. When I was living and studying there long ago, it was all ugly tracks near the Flinders Street station. What they have done is to cover it and made it into Federation Square. It's now a place where everyone gathers. I wonder if they can do something similar. This depot is not below ground like in Melbourne, so I guess they just can't cover things up. But they can use the space below the huge depot right? Or divert the excess flood water into the South Tunnel of the S$3.65 billion Deep Tunnel Sewerage System? What is this photo showing? 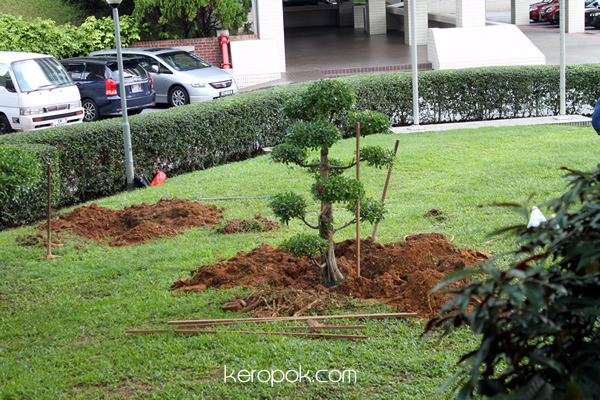 Tree planting Singapore style! An hour before this photo was taken, it was just a green patch of grass. A moment later, foreign workers (a species that Singapore folks always complain about, but really can't live without them, just like Singapore folks and air-conditioning) are there to dig a big hole in the ground and then with their hurculean strength (with the help of machines) puts the plants in place. They will then cover up the soil with some new grass patch and tada! a beautiful manicured garden. 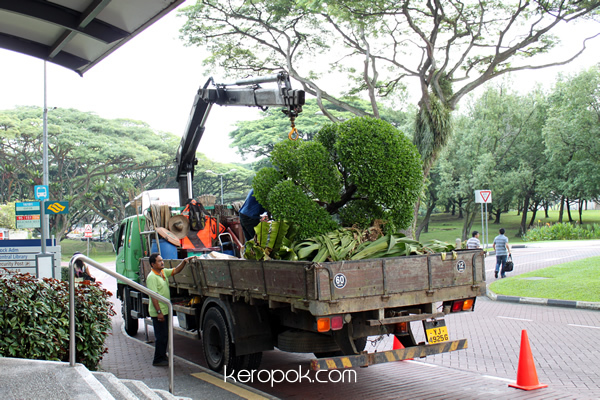 We all live in instant world, and I think I like the way they plant tress in Singapore. Everything looks so nice instantly. But I wonder if the roots of these trees will go deep enough into the ground. Will they survive when there is a thunderstorm? I think their roots are shallow and don't go deep in the ground. Here's another bigger tree that's going to be transplanted into the ground. 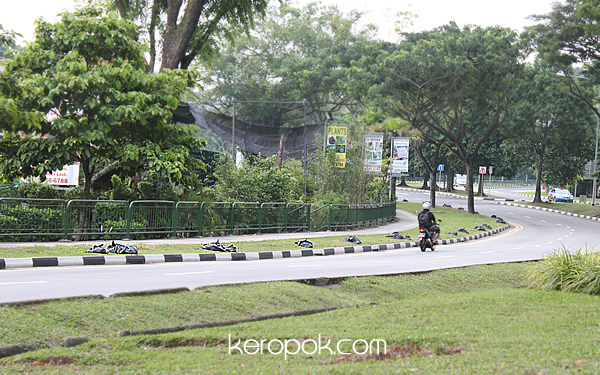 I wonder if these trees are planted in Singapore or is it from Johor, Malaysia? Talking about trees, do you also know that in Singapore there is something called a Heritage Tree? It's something like a Heritage building, that is earmarked to be preserved. Heritage Trees are trees that has gracefully matured in this country over the years (and I am pretty sure, instant trees above are excluded even if they have lived here for a long time). In Singapore, trees and buildings have to always give way to the so called 'renewal process'. Heritage trees are given immunity just like in the reality show "Survivor". - the bus companies having changed buses, so they need to train new drivers on how to drive the new buses. It was the first time I was just next to a stationary training bus. Ooo. 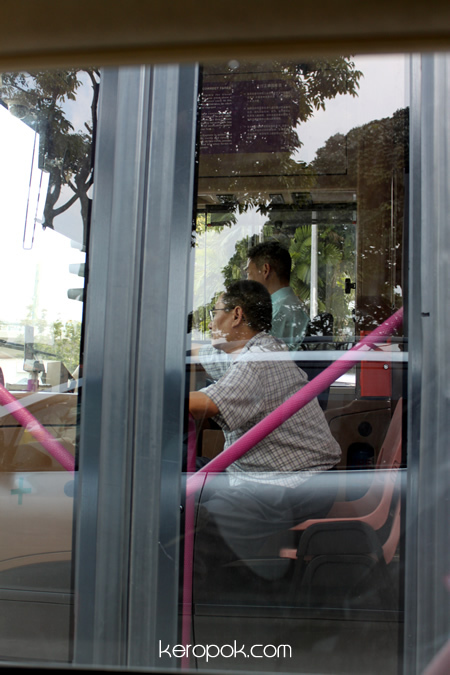 The trainer just stack two chairs and sit and train the bus driver. Guess what? My colleague thought I was mad when I said I wanted to get all the different kind of driving license in Singapore. I was thinking of getting a Class 4A - Omnibus license! After doing all the research about getting a license, I realise that I have to submit the application through SMRT or SBS Transit. Hmm... I don't want to work for them, I just want to get the license for my own ego collection. I think the urge to get the license started when Kim Ng got a license! I want too! 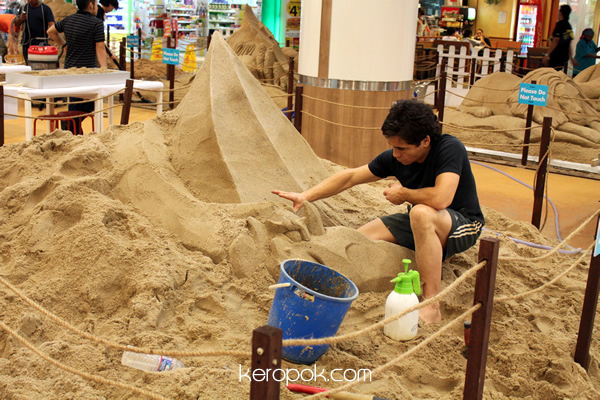 Colleagues and I were having lunch at the West Coast Plaza just the other day and we saw lots of sand in the mall. 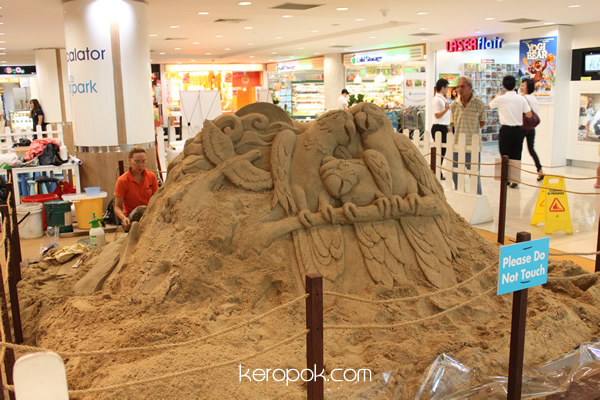 The sand was being sculptured into something really beautiful. 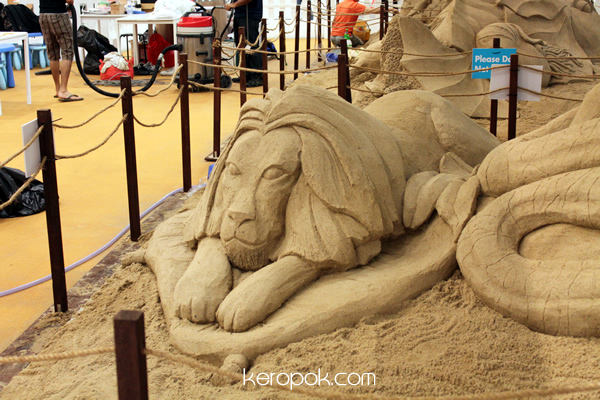 This man was hard at work getting his sand sculpture done. 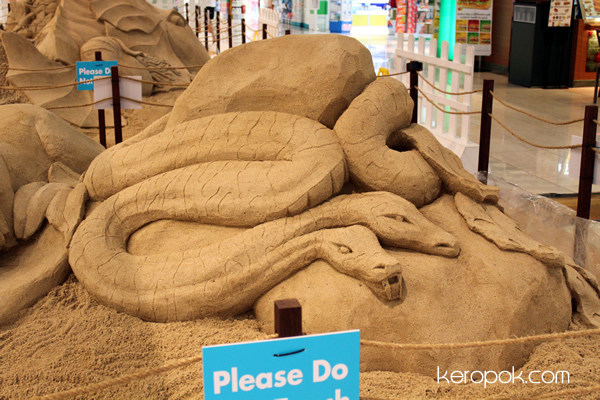 After taking a look, we think it's not as easy as it seems! This two headed snake looks really mean though. Ah.. Look at these lovely parrots. Sorry for not posting this up earlier, I think the event has ended. By the end of this month, the Keretapi Tanah Melayu (KTM) trains from Malaysia will stop traveling into the heart of Singapore's CBD at Tanjong Pagar. 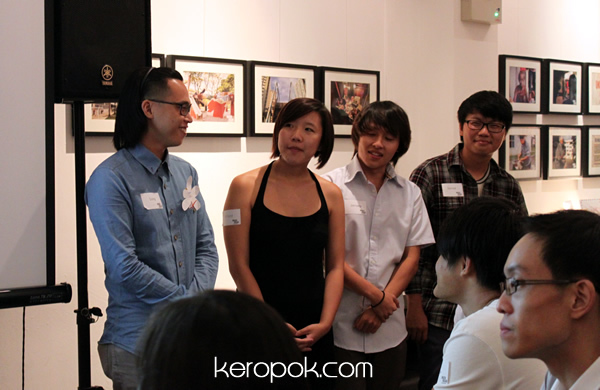 The governments of Singapore and Malaysia reached an agreement on 24 May 2010, (about a year ago!) to relocate the last stop for KTM's train to terminate at Woodlands Train Checkpoint. 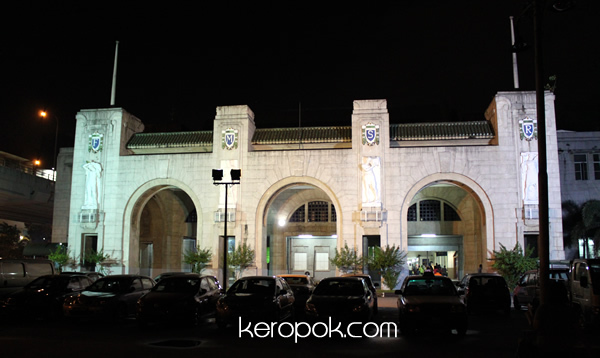 The Tanjong Pagar or Keppel Road station which opened in 1932 will cease operations on 1 July 2011. Do you see FMSR on the pillars of the building? It stands for Federated Malay States Railways. It has so much historical significance that this building has been gazetted as Singapore 64th National Monument. For Momo and myself, we want to be part of history. We will be taking the last train on 30 June 2011 that will come into the Tanjong Pagar station. We are following a group of online friends that we have not met! If you are interested, go visit: http://www.facebook.com/LastTrainToTanjongPagar If you read today's Straits Times, you would have seen the article in the Life Section. Another interesting fact that I read online is that, the Sultan of Johor, HRH Sultan Ibrahim Ismail will be driving the last train out of Singapore. 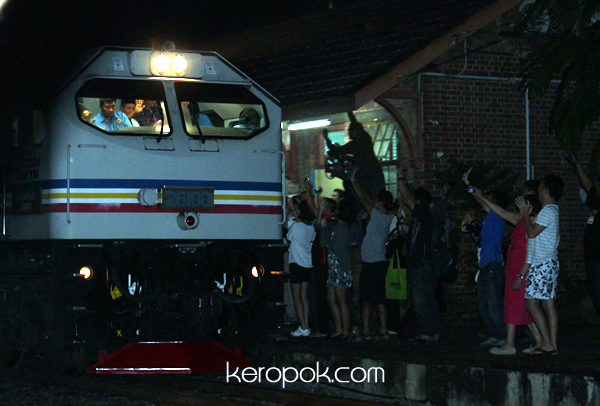 The Sultan of Johor is a 'train person'. 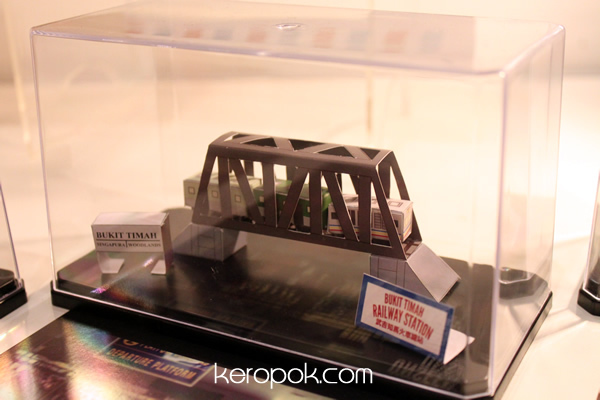 He has driven the KTMB's train a few times, and you can read it in the news. There are buildings around Singapore that are known as 'Black and White'. They are usually the colonial houses and it seems they are always painted black and white! I wonder what were their original colour when they were built long ago. 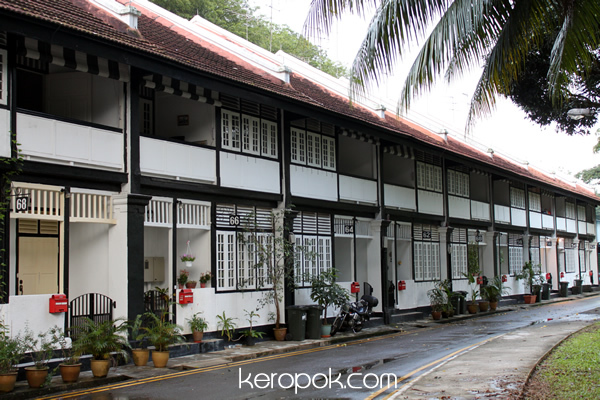 This row of Black and White colonial terrace houses is situated along Monk's Hill Terrace. It's just beside one of Singapore's most famous food centre, Newton Circus. Newton Circus was old and dilapidated and a few years ago, they decide to renovate it. 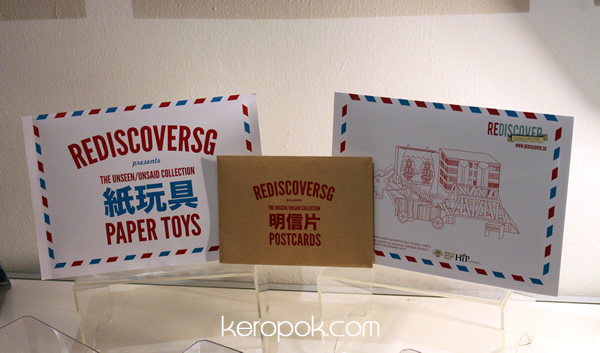 Do you know the new design is supposedly based on the design of these terrace houses? I am not sure, but I think they are mostly businesses that are renting these properties. There was a huge downpour yesterday and many places got flooded. I always thought Singapore IS an island, surrounded by water, of course it will flood when it rains too heavily. 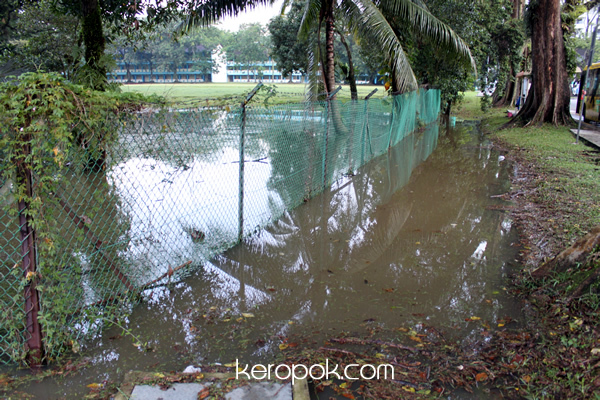 It floods in the US, Europe, Australia even our neighbouring countries Malaysia, Indonesia etc. At least when in floods here, it recedes within a few hours. It seems that the 'cheng hu' / government reacts rather quickly now. We don't expect them to do much, but since they just promised in the recent election to do something, might as well complain to the core to get things that will supposedly be done in the future to be fixed immediately. After all, we paid our taxes. You can see the photos of other floods online, I thought this photo looks like what Singapore was maybe 20 years ago? Old style fencing. Water puddles. Open fields, usually a school's field. Boys will soon play football again and they will all be super muddy! The photo was taken yesterday afternoon at Newton Circus. When you are a man, and you have grown old, what do you do? 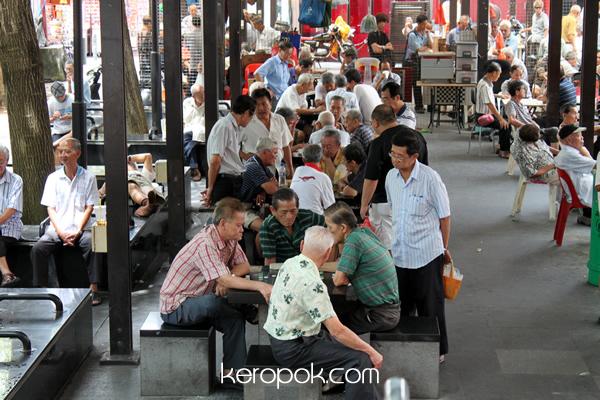 These men are seen daily playing chinese chess at Chinatown. In many places especially at 'void decks' (the empty or ground floor or the Singapore public housing flats) there are old men like this gathering playing chess. We see signs like this everywhere. 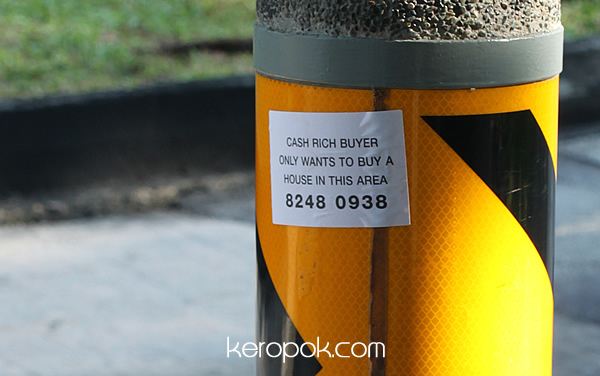 You think people don't simply paste notes in neat and tidy Singapore, but the reality is that Singapore's like other countries. It puzzles many locals how some people can be so rich and afford to pay so much cash for houses when the prices are now sky high! Probably this piece of news published on WSJ explains. It says Singapore has the highest concentration of millionaires in the world. Higher than Switzerland it seems. Is the report accurate it says 16% of households have at least 1 million in assets. Well I am not one of them. Well, we know for sure the Members of Parliament in Singapore get that much a month! The Theme for the City Daily Photo bloggers for the month of June is "Under Construction". 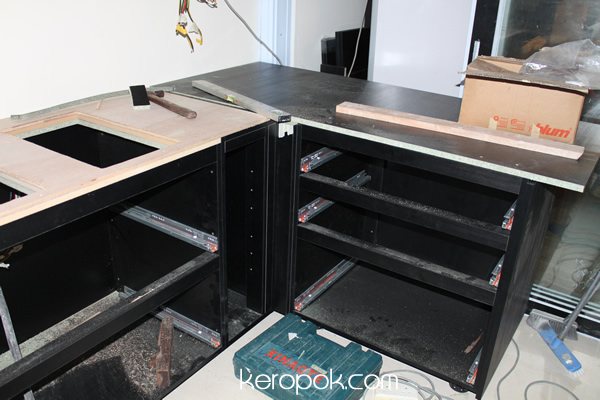 This is the photo about a month ago of the kitchen in our house under construction. So glad that everything's now fixed up and it's looking pretty good.